Sometimes, I get stuck in the design process. That’s when I need to give myself nudges that break up the mental and emotional constriction that is keeping me from moving forward in a project. And, so, I reach for some of my favorite tools that help me to see things differently. Really! 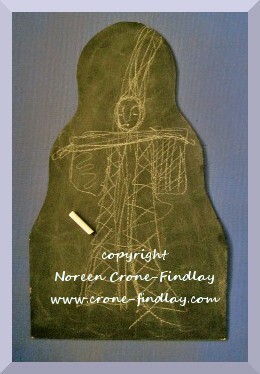 A chalkboard is a fabulous tool for knocking the design blechs sideways! I have wondered about why they work so well for me and I think that there are a couple of reasons. The first is that white chalk on a black surface reverses the way I normally see things when I am drawing. This is invaluable, because it clears the deck of any pre-conceived notions that I had about sketching. It’s like working with negatives instead of photographs. You really do see things differently. And, if you are stuck, then that is really helpful! The second reason why I love chalkboards so much is that drawing on a chalkboard is so playful. There’s a real feeling of ‘little kid’-ness to them that is definitely very freeing. You know that it’s not permanent… it’s just a bit of dust on black paint … so wheee…… draw, draw, draw! If you don’t like it…. whoosh whoosh, wipe it off and it’s gone. If only the rest of life were so easy! AND… if you do like it, then grab a piece of paper and a pencil and copy the sketch onto the somewhat more permanent surface. How did I get such a neat shape chalkboard? I drew the shape on masonite, cut it out and painted it with several coats of chalkboard paint from the hardware store. I even like the scritchy sound the chalk makes when I am drawing. Low tech is often a wonderful way of opening the doorways to creativity and imagination. PS: Anne, who is one of my online friends in the Mirrix facebook group suggested that you take pics of your favorite sketches and load them into your paint or bead making programs. I don’t use those programs, so it didn’t occur to me.